Growing up in Maryland, she learned from her dad - visual artist, guitarist and Stella guitar expert Neil Harpe - as well as watching blues heroes John Cephas and Phil Wiggins, John Jackson, Eleanor Ellis, Warner Williams and others at the famed Archie’s barbershop in Washington DC. Erin’s musianship and vocals have earned her many fans, including guitar greats Ronnie Earl and Billy Gibbons. In 2016 she released an instructional guitar DVD/download, Women of the Country Blues Guitar - for Stefan Grossman’s Guitar Workshop. 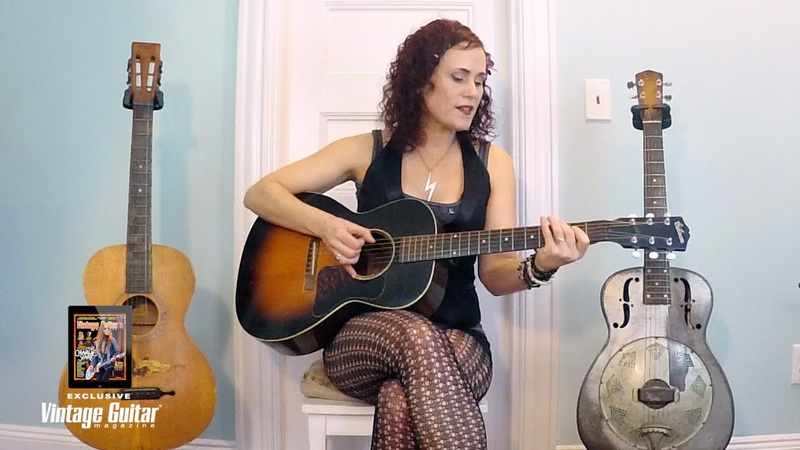 Erin loves to play the down home acoustic blues and has played with Phil Wiggins, James Montgomery, Warner Williams & Jay Summerour, Eleanor Ellis, and many more and opened for some of the blues greats including ZZ Top, T-Model Ford, Honeyboy Edwards, Roy Bookbinder and James Cotton. Erin Harpe plays classic blues stylings with help from three very cool guitars – a ’38 National reso, ’34 Gibson L-00, and a ’20s Stella. On Friday 27 July 2018, Reverend Robert http://www.revrobert.com will be doing a house concert at my home in Cadnam, New Forest. Rev. Robert will be on tour in The UK in July and I'm delighted to have booked him for this event. He is a specialist in blues and jazz from the 1920s and 1930s and the house concert will be an opportunity to meet him and enjoy his music in the relaxed atmosphere of my kitchen! Zoë and the band have come right to the fore of the British Blues Scene as a result of an intensely busy, exciting and creative three years. Their latest live recording 'I'll Be Yours Tonight’ (Jun 2015) is their fourth release in three years. It follows hard on the heels of the acclaimed studio albums 'Exposed' and 'The Blues Don't Scare Me', both of which generated a series of awards and nominations including Runner-Up for ‘Best Band’ in the 2015 British Blues Awards, plus Runner-Up for Zoë in the 2014 & 2015 British Blues Awards. Their exciting live set is based around the band's rootsy originals; featuring strong catchy riffs, interesting arrangements and exciting grooves, providing the perfect vehicle for Zoë's yearning, passionate and commanding vocal style, and Rob's unmistakable touch and flow on guitar. The highly accomplished rhythm section of Pete Whittaker-Hammond organ, and Paul Robinson-drums (Nina Simone, Van Morrison, Paul McCartney to name a few) bring massive musical authority with the ability to push the music in unpredictable and exciting directions. Zoë has made a considerable impact in a very short space of time and is one of those new artists that have added a fresh approach and vibrancy to the thriving UK blues scene. Press Release: The Spikedrivers at Milford Blues Night, Saturday 12 December 2015. Milford Community Centre. The Spikedrivers are one of the most original, innovative and exciting bands on the live music circuit. The bluesy combination of Ben Tyzack's sublime slide guitar, Constance Redgrave's deceptively simple bass lines, Maurice McElroy's precise drumming and percussion, along with their distinctive vocals and harmonies, creates a sound that is familiar yet different to anything you've ever heard before. Their roots are firmly in the Mississippi Delta, but their songwriting and arranging talents bring them right up to date. Their music has been described as 'haunting', 'gutsy', 'tribal' and even ‘psychedelic’. Spikedrivers are the new sound of transatlantic blues. Press Release: Del Rey and Adam Franklin at Milford Blues Night, Saturday 12 September 2015. Milford Community Centre. The next Blues Night at Milford on Saturday 12 September, hosted by Bob Long, will feature Del Rey from The USA (the first time we have hosted an American blues artiste) and Adam Franklin. Adam Franklin is a superb exponent of blues and ragtime from a Golden Age of American music. With a voice that is both powerful and soulful and equally at home on guitar and resonator ukulele, Adam’s performances are intense, energetic and highly entertaining. He makes his way through the pre-war American songbook, mixed with original songs that sound like they were written 80 years ago.Playing solo, his guitar is a band in a box and the floor is a drum kit. Giles has been singing and playing roots blues, solo and with The Aviators, across the UK and Europe since the sixties, on guitars acoustic and electric, and harmonicas - his trademark is simultaneous nose-and-mouth harmonica playing! He's a regular on blues festival and club circuits in England and on the continent, and has featured repeatedly on radio in England and France. Giles's passion is to share the emotion of a blues song. Critics and audiences say he draws them into the blues feeling - joyous, ribald or sad - like no other. Clyde Stubblefield, James Brown's legendary drummer once called him "the funkiest singer I've heard in Europe"! Perhaps that’s why The Times’s critic said “He sings and a whole bar-room is rapt”, and Blues Matters called him “one hell of an entertainer”. The French magazine Blues & Co described a recent set as “ Un moment de pur blues, fait d’émotion et de feeling” – which doesn’t need translating! Dazzling, funky, rhythmic interplay and groove are The Aviators' key features - one reason why they're in demand for party gigs as well as blues festivals! The Dan Sowerby Band were finalists in the UK wide search for the best new blues talent: New Brunswick Battle of the Blues 2011. The band’s set is a wonderful blues ride from seriously upbeat, rocking and dancing blues to those real soulful 'bring down the volume' moments that get everyone's hair standing up. Dan performs on both resonator slide guitar and the standard electric guitar and is backed by Matt Paull on double bass and Ben Coley on drums. Whilst only a three piece they pull off a big electric blues sound! The band material is a mix of Dan's own amazing array of songs and many carefully chosen blues covers given the Sowerby treatment! Before making a name for himself on the blues circuit, Dan cut his teeth working as a guitarist for other artists. Some unusual highlights include playing for soul legend The Drifters and playing in bands supporting acts, including Katie Melua and The Manfreds. But now, using all this experience and leading his own band, Dan solely follows his own true passion; the blues. The show will be hosted, as usual, by local bluesman Bob Long (website www.bobalong.co.uk) and there will be support acts TBA. The next in the series of Blues Nights at Milford will be on Fri 16 May, 2014, featuring Scarlett Rae & The Cherry Reds http://scarlettraeband.co.uk/? This is sure to be a lively evening! The next Blues Night at Milford-On-Sea Community Centre on Fri 24 January will feature the talented duo, Babajack. This will be the third in the highly popular series of blues concerts at Milford. Becky Tate and Trevor Steger are the song writing core of BabaJack. They have already released 3 albums since 2009, each one getting greater attention from the media and the music loving public. Rooster (released in March 2012) placed 2nd as Best Album in the British Blues Awards 2013. What sets BABAJACK apart is their approach to blues: their music is recognisably infused by early blues, but by no means bound by it. Becky brings roots/ funk/African rhythms and her beautiful lyrical voice, and Trevor brings his own flavour of punk meets Ry Cooder! to his slide style and harmonica. In the tradition of the early blues, they make their own instruments: Trevor’s homemade growling ‘WineBox’ guitars and Becky’s cajon (box drum) and stomp. Award winners! BABAJACK are British Blues Awards Winners (2012/2013) This year they were nominated 5 times and were runners up in 3 categories including Best Acoustic Act, Best Harmonica Player, Best Album (Rooster), and Becky has won Instrumentalist of the Year for two years running! They represented the UK at the European Blues Challenge, placed 5th. They were Bluesmatters! Magazine Band of the Year 2012, and Becky was one of 3 nominated Instrumentalist of the Year for the FATEA Folk Roots Awards. Supporting performances will be provided by local blues duo, The Rezzonators (Mike Shipman and Peter Gabony) http://www.rezzonators.co.uk and the talented, young blues singer, Elsie Franklin, appearing in Milford for the first time. The Blues Night at Milford in June was such a success; they are going to do it again. The second Blues Night will be on Saturday 12 October. The headline performers will be Lewis Cohen and Ben Somers, a highly energetic and entertaining duo, comprising Lewis Cohen on guitar and vocals and Ben Somers on double bass and vocals. The event will be at The Milford Community Centre, a splendid music venue which stages folk, jazz and many other performances. The show will again be hosted by Bob Long; a local bluesman with a liking for early, acoustic blues, ragtime and jug band music www.bobalong.co.uk Bob explains, “ The turnout last time and the feedback from the audience has prompted us to do it again. We have in mind to make this a regular but infrequent event, every few months”. In addition to the Lewis Cohen/Ben Somers duo, there will be support from local blues musicians. This groundbreaking book, written by Max Haymes, one of the foremost blues historians in the UK, is based on over 30 years' research, exploration and absolute passion for early blues music. 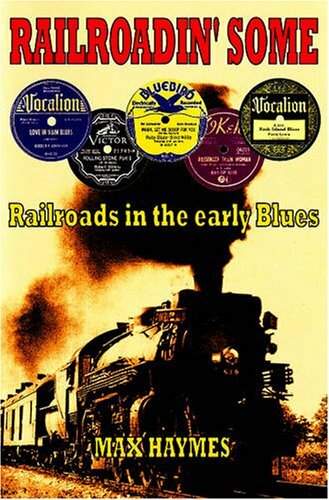 It is the first ever comprehensive study of the enormous impact of the railroads on 19th and early 20th Century African American society and the many and varied references to this new phenomenon in early blues lyrics. The book is comprehensively annotated, and also includes a Discography at the end of each chapter. This book is clearly the result of many years of painstaking, detailed research. As far as I know, it is the only book on this subject, i.e. the importance of the railroads in the lives of African Americans in the late nineteenth and early twentieth centuries and how this is reflected in the lyrics of early blues recordings. It is hugely informative and very readable. This book will be an important reference work of benefit to future generations of blues scholars. It will also be of great interest to all those who play early blues and love listening to it. Blues lyrics are often a mystery to the present day listener; this book does much to penetrate the mysteries and provide authoritative explanations. I've just finished working on a guitar "project". This is a Gibson L-37 (1935) which I bought on Ebay last year. The guitar has had a very hard life and was in very poor condition. It had cracks and splits. several holes in the top where pickup controls had been put in, then removed and had been badly refinished with brown paint and varnish. I decided to refinish it in black to hide the repairs to the top. A few of the L-37s made in 1935 were black. It now has new frets and new vintage-style tuners but everything else is original. I've added a Teisco (DeArmond-stlye, monkey-on-a-stick) pickup. It's now playing well and sounds good. Usually, old guitars don't reveal their history but this one does! It has two paper labels inside the body with hand-written information. It was first owned by William Emanuel Smith who bought it on April 18, 1936 at Warlick Furniture Store, Bluefield, West Virginia. He paid $38.5 incl tax. He lived in Wayne, Michigan 48184. I've put photos with titles and descriptions on my Flickr site and here are the links. Please take a look. I'll be attending a ceremony to mark the long-awaited opening of the road into the cemetery in Crystal Springs, where Tommy Johnson was buried. After years of struggle, the family have won a legal battle to restore public access to the cemetery and thereby allow the grave marker (generously provided by Bonnie Rait many years ago) to be put on his grave. I'll also be helping to judge the entries in The Hot Tomales Festival in Greenville and playing the blues in The Hambone Festival in Clarksdale. Just got home after a trip to The USA. We flew to Chicago, picked up a rental car and drove down part of the former "Route 66" to St Louis. In St Louis we visited my friend, Susan, who was a wonderful host and guide, did some sightseeing and went to a blues jam in which I played with a borrowed guitar. Then we drove down through Missouri, Arkansas and Tennessee to Mississippi. Then we stayed with the cousins in The Delta, did the King Biscuit Time radio show with Sonny Payne in Helena, AR and a river trip with John Ruskey of The Quapaw Canoe Company. Our last weekend was spent mostly in Clarksdale for The Juke Joint Festival in which I played at The Bank stage with Da Bones Man, my friend Randy Seppala. I'm pleased to announce my new album, Delta Harvest, is now available. If you would like a copy (only £5) just send me an email. It was recorded in Duncan, Mississippi by Bill Abel at the Big Toe Studio in October. 1. Boogaloosa Woman is a Tommy Johnson number, recorded in 1929 but unissued. It relates to Tommy returning to Boogaloosa after lengthy ramblings and finding his girlfriend in a poor condition. 2. Diggin’ My Potatoes is a Washboard Sam (Robert Brown) song, recorded with Big Bill Broonzy in Chicago in the 1940s and covered by Lonnie Donegan in the early 1950s. It was considered to be too sexually explicit and banned by the BBC in 1954. 3. Peavine is a Charley Patton song about the Delta railroad that ran from Rosedale to Dockery’s by a tortuous route. The lyrics include a reference to the Delta flood of 1927….”the levee is sinking, you know I can’t stay here long….” This desperate situation was very nearly repeated in May 2011. 4. Miss Mae Belle is a mono-chordal Hill Country song from RL Burnside about lustful pursuit of a beautiful woman…. 7. Bye And Bye is a Tommy Johnson song about ending a relationship which is both sad and philosophical. In the first verse I have used the lyrics preferred by his younger brother, Mager, because they make more sense. 8. Aunt Caroline Dye was a hoodoo lady who lived in Newport, Arkansas. She was the grandmother of the composer, Will Shade of The Memphis Jug Band. In this song, she gives her grandson some advice…. 9. Canned Heat. A Tommy Johnson classic recorded in 1928. Tommy confronts the inevitability of his death from drinking Sterno (cooking fuel), admits to his helpless alcoholism and praises the drink’s short-term effects. He must have been tough; he survived to the age of 60! 10. Milkcow’s Calf. A collection of Delta blues would be lacking if it didn’t include a song from Robert Johnson. I like the elaborately crafted and consistent double entendre. 11. Lonesome Home. One of three Tommy Johnson songs with the same name! I think you can hear a little of Blind Lemon Jefferson’s influence in the guitar in Tommy’s version. 12. Last Chance is a Gus Cannon song which he recorded both with and without Noah Lewis in the late 1920s. This is about a relationship which seems doomed to failure. I love the lyric “you’re just a trifling woman, don’t mean me no good no how”. 13. Screamin’ And Hollerin’ is a Charley Patton song which I consider to be one of the Delta blues classics and which has inspired countless re-interpretations. I love it. Here is yet another…. I've just got home from a trip to The USA. I flew from London to Chicago, then took another flight down to Memphis, then drove south down Highway 61 into Mississippi. Going across the state line between Memphis and Tunica and seeing the landscape flatten out as I enter The Delta, is always uplifting, even when I'm tired. It was harvest time in The Delta.....a busy time. I was surrounded by cotton picking and rice and soy bean harvesting. The crop-dusting aircraft were swooping and turning....sounding like a WW2 film about The Battle of Britain. Highlights of my stay were a gig at Hambone's Gallery in Clarksdale, in which the owner, Stan Street, joined me on harmonica, recording a new album, "Delta Harvest" (mostly old Delta blues) at Bill Abel's Big Toe Studio in which I was joined by Randy Seppala "Da Bones Man" on percussion, playing at Mike's Fish Fry at Shack Up Inn at Hopson's, and going to The King Biscuit Festival in Helena, The Cat Head Minifest in Clarksdale and The Pinetop Perkins Homecoming at Hopsons, which of course, was the first without Pinetop himself. Last November I bought a 1934 National Trojan guitar. It was in good condition for its age, at least in the sense that it had not been modified or worked upon and was therefore still "all original". The problem with it was that it was unplayable; the neck had warped to the extent that the action at the twelth fret was about 12mm. So what was needed was a neck re-set, an operation involving removal of the neck from the body, straightening it and replacing it at a slightly different angle. Also, the tuners needed some repairs and the frets needed to be replaced. My next trip to Mississippi will be in September, 2010. I've learned some more Tommy Johnson songs and I'm looking forward to performing them at this special event. Also, I'll be visiting friends in Mississippi, including the Tommy Johnson relatives and Ben Payton and in Memphis,Tenessee and doing some gigs in Jackson, MS. (details on the gigs page of this site). Festival: Blues & Booze InThe Bury, Odiham. Ben Payton, from Jackson, Mississippi, USA, has been living the blues most of his life. Now in his sixties, he’s a “real deal” bluesman of the old school, singing and playing traditional material and his own songs on acoustic guitar. Ben’s appearance at Odiham will be part of his first tour in the UK. Ben Payton was born in tiny Coila, Mississippi, in the hill country just east of the Delta. His early musical influences included his grandmother Mabel Johnson’s gospel piano playing and his Uncle Joe Birch’s blues guitar. Featuring the mellow soulful voice of Phil Mills, with his jazzy finger-style or bluesy slide guitars and showcase harmonicas, backed up by the solid 12-year partnership of rhythm section Schultz (on a 2-drum kit) and Teej (acoustic double bass), Red Jackson have developed a laid-back but passionate approach to the blues. They perform a mix of blues styles: from the slow, haunting blues of the Mississippi delta to the rolling beat of Chicago, picking up street grooves from New Orleans, Texan boogie and a touch of hill-country ragtime along the way. This is the blues of the '40s and '50s, the blues of Muddy Waters, Howling Wolf, T-Bone Walker and Big Bill Broonzy to name just a few. I managed to dodge the volcanic eruptions, or should I say disruptions and the tornadoes that rushed through the Mississippi Delta and now I'm back home. In between musical frolics I had a lovely boat trip on The Mississippi from Greenville up to Lake Whittington with Bo' Weevil and Hank, Jackson, who is half Labrador/half Bassett and Cousin Lil. Cousin Henry Earl was busy planting rice and beans and alternated between praying for rain and praying for it to stop raining....but still maintained his usual good humour. This year my gig at Clarksdale Juke Joint Festival, Saturday April 17, is on the train! This year's Blues & Booze In The Bury, the annual open-air blues and real ale festival in Odiham, Hampshire, UK, will take place on Saturday 26 June 2010. Watch this space for news of musicians booked for this year's festival. Meanwhile, I'm delighted to announce we will have Reverend Robert, http://revrobert.com/ all the way from the USA, appearing as part of his European tour this summer. And from Jackson, Mississippi, USA, Ben Payton, http://www.benpayton.com/. Ben is the "real deal" bluesman and this will be his first appearance in the UK. Clarksdale, Mississippi -- A decade into the 21st Century, Mississippi's juke joints are still the stars of Clarksdale's annual Juke Joint Festival & Related Events this April 16-18. Pre-sale wristbands are now on sale for the world-famous event at www.jukejointfestival.com. "We're the only festival in the world where some raggedy old blues clubs are as important as the festival's big headliners," explained Roger Stolle, music coordinator for the festival and owner of the Cat Head blues store. "We offer the music, culture and history that no other blues event outside of the Delta can match. Honestly, you could say it's one of the world's most authentic blues fests." Now in its seventh year, Juke Joint Festival regularly draws attendees from over 15 foreign countries and nearly all 50 US states. Still, the homegrown event holds a special place in the hearts of locals festival-goers as well. "Juke Joint Festival truly lives up to its tag line," said Nan Hughes, president of the Clarksdale Downtown Development Association that puts on the popular festival. "It's half blues festival, half small-town fair and all about the Delta. From a student art show and racing pigs to a mini film fest and plenty of blues music, it's got it all -- something for everyone." The Juke Joint Festival itself is Saturday, April 17th, with related events on that Friday and Sunday. Kicking off on Saturday with a 5K/8K run at 8am, the vendor booths and live music fire up at 10am. With the exception of music and education events on the Delta Blues Museum's outdoor main stage, most of the daytime entertainment will wrap up around 5pm. The main stage runs till 7pm. At 9pm, the juke joints themselves become part of the action. "This year, we anticipate having as many as 17 nighttime juke joint stages," according to Stolle. "From big clubs that hold 200 people to tiny jukes that hold 30, we've got it all." At press time, official festival nighttime venues include Ground Zero Blues Club, Red's Lounge, Sarah's Kitchen, Delta Amusement Cafe, Tricia's, Bluesberry Cafe, Stone Pony, Hambone Gallery, Club 2000, Messenger's, Pete's Grill, Delta Blues Room, Anniebelle's, Hopson Commissary (front stage and back porch), Juke Joint Chapel at Shackup Inn and Hick's Tamales. Musical acts performing in Clarksdale during festival weekend include Honeyboy Edwards, Big George Brock, Super Chikan, Big Jack Johnson, Watermelon Slim, Jimbo Mathus, Cedric Burnside & Lightnin' Malcolm, Johnny Rawls, Rev. Peyton's Big Damn Band, Blind "Mississippi" Morris, Stacy Mitchhart, James "T-Model" Ford, Jimmy "Duck" Holmes, Terry "Big T" Williams, Foster "Mr. Tater" Wiley, Robert "Wolfman" Belfour, Josh "Razorblade" Stewart, Guitar Mikey, Robert "Bilbo" Walker, Cedell Davis, Bob Long and dozens more. In total, over 50 blues acts will play in town as a result of festival events. As always, the price is right for Juke Joint Festival. "We want everyone to come out and enjoy the festivities," said festival co-organizer Goldie Hirshberg. "The official daytime events are free once again, and the nighttime wristband is still only $10 -- the same price it was seven years ago when the festival started." On Friday 27 November, I had a wild night in Basingstoke! I was playing the blues, solo, for the Beer Festival at The Moose Centre. Serious beer tasting by CAMRA beer afficionados and lots of raunchy, lively blues to keep them in the mood... Robert Johnson's "They're Red Hot" went down really well. Blues & Booze In the Bury, the blues festival staged annually in Odiham, Hampshire, England, held its third event on Saturday 13 June 2009 This year's line-up was Martin Wood Bob Long Kindablu (Stu Weetman, Tom Weetman and Neil Warren) National Steel ( Stuart Cumberpatch and Lewis Cohen) Robin Bibi Band The sun was shining, the real ales were flowing, the music was good and everyone had a good time. For photos, click "photos" button on the home page, then click the Flickr link. Blues & Booze In The Bury Sat 13 June 2009 This event combines a blues festival, a real ale festival and a family fun day, raising funds for charities, including The Neurofibromatosis Association (NfA). It is located open-air in The Bury, at the heart of the beautiful old town of Odiham, Hampshire, United Kingdom. The music starts at 12 noon and finishes at 6 pm. Entry is free and there’s plenty of parking. As in previous years, the emphasis of this successful event will be on acoustic blues. The line up is: Robin Bibi Band National Steel Kindablu Bob Long Martin Wood Robin Bibi Band Robin Bibi is one of the UK’s top blues/rock guitarists and having paid his dues working with such names as Robert Plant, Jimmy Page, Ben.E.King, The Pretty Things and Helen Shapiro, launched the Robin Bibi Band in 1996. The Band’s debut album ‘Blue Thrash Therapy’ was released a year later and quickly sold out leading to a recent re-release. Five albums on, Robin’s acoustic album ‘Fast Life Songs’ has also received critical acclaim and continues to sell well. Blues, funk, soul, rock, reggae and jazz are all rolled together in The Robin Bibi Band's own feel-good concoction. Because of its widely known reputation with a highly entertaining stage presentation, the Robin Bibi Band is now one of the busiest bands round the Southern music venue circuit and has played most of the major Blues festivals in the UK, Ireland, and Europe .It's exuberant passionate, dynamic, exciting and fun! This is music played straight from the heart, it will move your head, your heart and of course your feet! More information at http://www.robinbibiband.co.uk National Steel This duo combines the outstanding slide guitar and finger-picking talents of Lewis Cohen and Stuart 'Marshcat' Cumberpatch to re-create the masterpieces of the golden age of acoustic blues. The duo play a stunning collection of the vintage guitars featured on so many 78 rpm records. If there's anything which sounds better than the blues played on a vintage National guitar, it's the blues played on two of them! This is a great opportunity to hear the authentic sounds of the juke joints of the Mississippi Delta in the 1920s and 1930s. More information at www.lemonrock.com/nationalsteel Kindablu This trio comprises Stu Weetman, his prodigal son, Tom and Neil Warren. Stu Weetman has been playing the Blues for 45 years now, and has forgotten more songs than he has ever remembered. A multi-instrumentalist, Stu is equally happy on banjo, guitar, bones, or mandolin. He is particularly fond of Bo Carter, Beer, and Balti . Tom is a highly accomplished guitarist who lists Bireli Lagrene, Burning Spear and Brakspears as his influences Neil Warren wasn't even born when Stu started playing Blues, but the lad is a quick learner, and is now one of the finest Blues harmonica players in the country. He sometimes plays in towns, too. He is fond of Pizza, Rod Piazza, and Pale Ale. Together they play everything from Delta Blues to Swing, and usually manage to finish at the same time. Bob Long Bob Long is a British blues singer, guitarist and harmonica player specializing in "the old stuff". Most of what he plays is his interpretations of pre-world war II blues, jug band and ragtime material particularly music from the Mississippi Delta, where he is a frequent visitor. He has performed at The Juke Joint Festival in Clarksdale, The Tommy Johnson Blues Festival in Crystal Springs and the legendary Ground Zero Blues Club. When at home, Bob hosts a monthly acoustic blues jam in Southampton. Jointly with Keith Miller, he has recently released a new album “ I Wonder To Myself”. More information at www.bobalong.co.uk Martin Wood What's your idea of good music? If it starts with Muddy Waters, Willie Johnson, Furry Lewis & Blind Lemon, and runs through to JJ Cale, Bob Dylan and Van Morrison, take a listen to Martin Wood. Playing acoustic blues on guitar, slide guitar and mandolin, he updates the old classics, takes more modern songs back to the Delta and chucks in some of his own tunes in the same style for good measure .More info. at www. martinjwood.co.uk. I had a wonderful time visiting Mississippi and Arkansas in April. The trip combined the pleasures of seeing old friends, making new ones, hearing some good music, doing a little exploring and enjoying, as always, the southern hospitality. I even went to church….something I don’t normally do! Here I mention a few of the highlights, all of which are illustrated by photos on this site. (Go to "photos" and click the link to Flickr) My friend Bill Abel, one of the few professional Mississippi bluesmen still playing “the old stuff”, had a party which was well attended by music lovers. Guests included Cadillac John, Stan Street, Dirk Wissbaum, Terry Buckalew and his colleagues Deborah Smith and Katie Lambert from The Delta Cultural Center / Radio KFFA in Helena, Gerald and Hollan Deloach, cousin Henry Earl from Deeson and many others. Clarksdale’s Juke Joint Festival, now in its sixth year, seemed even bigger, with a large number of performances widely scattered in the downtown area throughout the day at the open air stages and of course, many bars, restaurants and clubs at night. It rained late Saturday afternoon but the show went on, where possible. Despite the rain, there was a good crowd, huddled under umbrellas, to see Honeyboy Edwards at The Delta Blues Museum Stage. At 93 years old, he just keeps going... Bill Abel had the pleasure of helping him along and it was a good performance. Charlie Musselwhite was at The Delta Blues Museum for a reception to celebrate the opening of a new exhibit of memorabilia from his extraordinary career. To my surprise and delight, he brought his band with him and we were treated to an excellent live performance. On April 21, the anniversary of the date the levee broke at Scott, MS in 1927 with the infamous flood of The Delta, there was a Mississippi Blues Trail Marker Dedication at the former “Delta Pines” Plantation in Scott. This was once owned by the British as a source of cotton to feed the mills in northern England. Today it is a Monsanto agricultural research centre. The company were gracious hosts and provided lunch for us all. The Marker is also dedicated to Big Bill Broonzy who (controversially) claimed Scott as his home. Bill Abel was booked to perform here and he asked me if I’d like to go with him. As I play Tommy Johnson’s song about the 1927 Flood, “Slidin’ Delta”, he invited me to perform it during the ceremony. In the crowd was Vera Johnson-Collins, the youngest niece of Tommy Johnson and President of The Tommy Johnson Blues Foundation. On Friday, April 24 I went to Helena, AR. I’d been invited to “appear” as a guest on Sonny Payne’s legendary King Biscuit Time show on KFFA Radio. Sonny, now well into his eighties, is still going strong, still teasing his guests with his inimitable, mischievous sense of humour and it was great fun. He kindly plugged the new album I recorded with Keith Miller, “I Wonder To Myself” and I played a couple of songs live. I then joined Terry Buckalew on his show, Delta Sounds and explained how my life, post-retirement, is busy again, now I’m working with British luthier, Dave King, making guitars. (see www.daveking-acoustics.com ). Later that day, after a few early evening refreshments at The Wild Hog Festival, which involves countless bikers, most riding Harleys, taking over downtown Helena, I drove back to Mississippi and called in at the Ground Zero Blues Club in Clarksdale. There, Stan Street’s band was setting up for the evening’s gig and Stan invited me to play some acoustic blues with himself on harp whilst the rest of the band took their break. Another highlight was a guided tour of Dockery’s Plantation by Bill Lester, Executive Director of Dockery Farms Foundation, which is restoring the historic buildings. Bill took a photo of me on the front step of the (now derelict) commissary building where Charlie Patton used to play on Friday afternoons when the men came to collect their pay. After he had left, I sat on the step with my guitar and played Charlie’s “Banty Rooster Blues” in that magical, historic place. And finally, on Sunday morning, I went to church (!) in Rosedale. Accompanied by my friend Leroy Nesbit, I went to the United Baptist Church. We were made very welcome and enjoyed some good gospel music! Yesterday evening I had the pleasure of opening for JC & Angelina at Third Thursday Blues Club located in South St.Arts Centre, Reading, Berkshire. It was my first appearance at this excellent club and a most enjoyable evening. Toward the end of JC & Angelina's lively performance, they invited two guests to join them on stage: Michael Messer and Stuart Cumberpatch....both playing slide guitar. It was a fantastic finale! Photos of the performances are on this site under "photos"
I'm now back in England after a trip to Mississippi to visit friends and play in The Hambone Festival in Clarksdale. Highlights included a Thursday night jam with Stan Street at Ground Zero Blues Club, a party at The Delta Blues Museum at which Stan Street presented a wonderful painting and Bill Perry played the blues, some wild nights at Red's Club, a Halloween Party with Stan Street's band and guests from Canada and New Orleans and the Street Party in East Second Street on Saturday afternoon, outside the Hambone Gallery. The Street Party was an open-air event with a real Delta style. The preparations took just 30 minutes. John Ruskey's "Quapaw Canoe Company" flatbed truck arrived and was parked at right angles to the axis of the street to form a stage, barriers were positioned to stop the traffic and a PA sytem set up on the truck with a power cable running from the Gallery. We then had excellent performances from Davis Coen, Bill Abel, Hambone and Terry Bean. I was delighted to have been invited to play a set myself and thoroughly enjoyed it. Saturday evening at Ground Zero was a great pleasure with excellent music and good company. I was joined for dinner by local bluesman Bill Abel, Vera Johnson-Collins and Ben Payton from Jackson MS and Maie Smith from The Delta Blues Museum. There are photos on this site. Go to "photos" and follow the link to my Flickr. The Tommy Johnson Blues Foundation is a charity based in Crystal Springs, Mississippi. One of its aims is to re-open and provide public access to, the derelict Warm Springs Cemetery, now cut off from the highway, where the body of Tommy Johnson has lain in an unmarked grave for over 50 years. In the Public Library in Crystal Springs is a magnificent gravestone for him, funded by Bonnie Raitt who has recorded some of his songs. But at present, it cannot be placed on his grave. The Foundation is working to address this problem and to boost awareness of Tommy Johnson's importance as one of the founding fathers of the blues This album includes three of his songs. In support of this cause, Bob Long and Keith Miller will donate 10% of the proceeds of sales of this album to The Tommy Johnson Blues Foundation. This album has been independently produced and will be distributed by CD Baby and available directly from Bob and Keith at gigs. Review of I WONDER TO MYSELF in BLUES MATTERS magazine New Album from Bob Long & Keith Miller Committed British Blues devotees, Long and Miller here present their interpretations of founding fathers Big Bill Broonzy, Charlie Patton, Robert Johnson, Muddy Waters and, in particular, Tommy Johnson – a largely neglected Bluesman who died in 1957. Long, particularly, is a self-confessed helpless case, adopting Mississippi as his spiritual and sometimes physical home, and this self-financed album is essentially a one-take homage to the music of the creators they love so much. Their journey travels through the country blues, jug-bands, vaudeville and inevitably, north to Chicago’s urbanisation and popularisation of the blues. Long and Miller apply great commitment, guitar, dual vocals and harmonica to re-create Tommy Johnson’s forgotten “Big Road Blues”, “I Wonder To Myself” and “Maggie Campbell Blues” – doing their hero proud and bringing his heritage to a new audience. Well-versed renditions of more familiar songs like Broonzy’s “Rocking Chair Blues”, Patton’s “Some Of These Days” and Robert Johnson’s “Me And The Devil Blues” (my favourite) sit comfortably alongside earnest versions of more obscure material. No attempt here to imitate American vocals; this sound is identifiably British from 200 yards away, and is all the better for it – just what you’d hope to hear in your local Blues club (and rarely do). Peter Innes, Blues Matters, 2008. The Southsea Folk And Roots Festival was held in Southsea, Hampshire, England over the holiday weekend of 23-25 August 2008. Monday was "blues day", with performances from a wide variety of singers and players throughout the afternoon on South Parade Pier. In the evening there was a grande finale with Mike Sanchez and his band. There's a photo of me playing slide on my National Radiotone Bendaway guitar here on this site under "photos" ( Click the link to my Flickr site to view). This year, I played solo, doing seven blues favourites. When this photo was taken by ace photographer, Arlene Kennedy, I was playing the RL Burnside classic, Miss Maybelle. This year's Blues and Booze In The Bury, held on Sat 14 June, was a big success. The event raised a substantial sum for the charity, The Neurofibromatosis Association, provided the crowd with some excellent music and real ales and everyone, young and old, had a good time. The event started with a Heroes Parade from RAF Odiham which ended in The Bury with a fine performance from the RAF marching band. Then at 12 noon the blues festival started and ran through till 6 pm. The performers this year were: Bob Long Pete Harris & Hugh Budden Jim Crawford Ernies Rhythm Section The Spikedrivers. All the musicians said they had enjoyed playing at this festival. There was a happy, lively atmosphere all afternoon. The people and companies who contributed time, effort and money to making Blues & Booze In The Bury 2008 a success are too numerous to list here but special thanks to Wooldridge Demolition and A J Blake, the principal sponsors and to Lee Jones, Sound Engineer, who stepped in at the last minute to save the show when the guy who was booked to do it, let us down. There are lots of photos of the event on this site under "Photos". Just click the link to Flickr. Last night was the inaugural Acoustic Blues Jam at The Platform Tavern in Southampton, England, one of the best live music venues in the city. The jam was hosted by Pete Harris and myself. The session attracted several local blues musicians, plus Flavio Bosi (harmonica) from Dorset. We were delighted to see celebrity, Derrin Nauendorf, turn up to join in and support this new, monthly event on its first night. There was an appreciative crowd in the bar and everybody had a good time. This will be a monthly event, held on the last Tuesday of each month. For photos of the event, go to "Photos" on this site and follow the link to Flickr. I spent most of October in The USA, attending The Arkansas Blues and Heritage Festival in Helena, The Cat Head Minifest in Clarksdale MS, staying with friends in The Delta, then travelling down to Jackson and Crystal Springs MS. The Festival in Helena was as good as ever and I’ve put some photos on this website; not necessarily the “big names” but people whose performances I particularly enjoyed. And it was good to say hello to my friends at The Delta Cultural Center and see Sonny Payne still going strong with his King Biscuit Time Program on KFFA Radio. In Clarksdale MS I attended The Cat Head Minifest which was as always, an excellent free event outside the store organised by Roger Stolle. I noticed Pinetop Perkins there, not to play, but sitting quietly in a shady spot on the sidewalk on Delta Ave., listening to T-Model Ford and others playing. No doubt he was saving his energy for his own performance later at The Pinetop Perkins Homecoming Party at Hopson’s! “Big Eyes” Willie Smith was playing at Hopsons and when Bob Margolin joined the band, the music was quite exceptionally good. Three days later I was back in Clarksdale. Bill Abel had a lunchtime gig playing for some very glamorous ladies at The Country Club. I enjoyed being Bill’s roadie and sitting in for a few songs. Stan Street and his band were playing at The Ground Zero Blues Club that evening and Stan asked me to sing some old country blues while the band had a break. Stan joined me on harmonica and we both enjoyed it. Ground Zero was full of young Italian and Croatian visitors that night and later on, the dancing was lively. Stan’s band, comprising Marshall Drew on guitar, Laura Craig on keys, Lee Williams on drums and Daddy Rich on bass, was excellent. There are photos on this site under “Blues In Mississippi” and one of Stan Street with his portrait of Howlin’ Wolf which I took at Hambone’s Gallery. The following day I made one of my visits to The Delta Blues Museum to see the Blues Education Program in action. I love to see these young people learning to play the blues and keeping it alive! I do what I can to support them. In Jackson MS I played at Hal And Mal’s (the Monday evening session of The Central Mississippi Blues Society), at JT Watkins’ Blues Jam at Elk Lodge and at Schimmel’s while the resident musician, my friend Ben Payton, took his meal break. On Fri 19, The Tommy Johnson Blues Foundation held their annual Reception at the Medical Mall at which I presented a paper on The Crossroads Legend and met many members of the Tommy Johnson family. Photos of this are under “Tommy Johnson Reception”. On Sat 20 October, the Tommy Johnson Blues Foundation held their annual Blues Festival in Crystal Springs. The weather was kind to us; warm and sunny all day. The show reached a rousing climax with JT Watkins and his band who put on a lively performance just before sunset. Photos of all the performers at the festival are on this site under “Tommy Johnson Blues Festival 2007″ Just before heading back home to England, I returned to The Delta where the farmers were busy with the harvest and I had great fun riding on a combine, cutting soy beans. I watched my last Delta sunset from the cab as the huge machine roared along the big field. I was sad to leave Mississippi, which now feels like my second home….